Married couple Mara Lapsa and Sean Burke, now living in Evanston (Illinois) in the United-States, told us how they met in Paris in the summer of 1996 (neither were full-time residents of France at the time). Mr Burke said his future wife was a 50-year-old widow with two children in their twenties when they met whereas he was 35 and unmarried. "Mara came to the United States as a little girl, her parents were from Latvia. She lived near Chicago. I was born in England to a British mother and an Australian father. When we met I was living in Sydney, Australia. "I had been a tour guide specialising in European tours for American student groups and had worked as a guide for nearly ten years. The previous year I had decided to stop guiding and I was working as a travel consultant in Sydney. However, a friend in Boston who had a small travel company persuaded me to come over to France to do one more tour. Mara was a first grade [elementary school] teacher in a small town in Illinois – about 80km away from Chicago. "The tour I was guiding was for a French teacher who was taking her high school students to Paris for ten days. This teacher needed an additional chaperone to help with the students and asked Mara to come along. She agreed. "After the tour Mara returned to her life in Illinois and I returned to Sydney, but we wrote letters to each other often and the following year when I was in the US we went out for our first date. "That summer we decided to travel to France together and spent two weeks driving around Provence. One evening we were searching for a place to stay and chanced upon a gîte in the village of Cotignac in the Var. It was June 17. I mention the date because, though we had not paid attention to this at the time, it was the very same date we had first met the year before. Later it was the date on which Mara received her first carte de séjour and the date on which we got pacsed in Brignoles, in the Var department in 2010." Mr Burke said Cotignac made a very strong impression on the couple. "We reserved the same gîte for two weeks the following summer, and the summer after that. 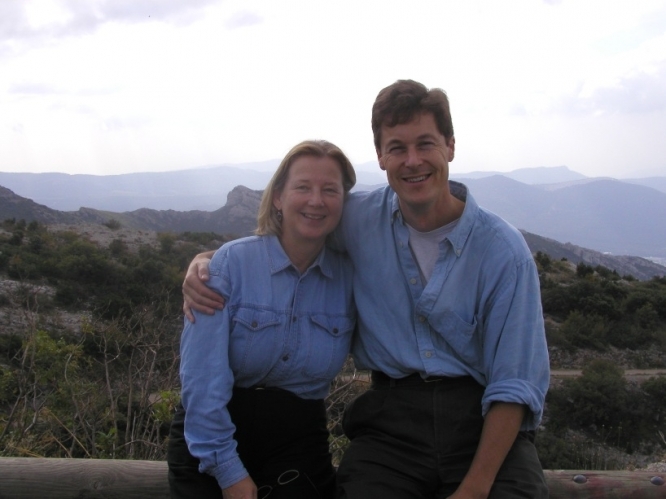 In 2000, Mara took early retirement and we decided to go to France and find a place to live in Cotignac. We sold our home in Illinois, gave away all our furniture and flew to Nice with just our suitcases. The following week I was having my hair cut when the hairdresser mentioned that a house was on sale in the village. It was exactly what we were looking for and we bought it the next day. It was just 50m away from the farmhouse we used to stay in. "We lived in Cotignac for fourteen years, had visitors from all over the world, learned French and established friendships which endure today. It was the great adventure of our lives. In 2014, we decided to move our home base back to the US, so Mara could see more of her grandchildren. We did not lose our connection with France or with the Var, as we spend several months each winter in Saint-Raphaël. "We have paintings of Cotignac and Paris on our walls, Michel Legrand on the CD player, Côtes du Rhône in the cellar and a copy of the Connexion on our table, so our love affair with France continues.